Little Elm Independent School District general information and student achievement data at both district and campus levels are provided on this page. Also presented on this page are descriptions, pictures and maps of moderately priced Little Elm ISD homes that currently are for sale. The ranking methodology used to identify school districts with best academic performance is presented on this 2019 best DFW school districts rankings page. The academic performance score provides a quick way to determine approximately where a school district's or school's student academic performance ranks among the performance of students in other Texas districts and schools. School districts and campuses with combined State of Texas Assessments of Academic Readiness (STAAR) and college readiness indexes ranked in the top ten percent of Texas school districts and schools are awarded an academic performance score of 10, districts and schools with combined academic performance indexes in the ninth decile receive a score of 9, and so on. Little Elm Independent School District currently operates five elementary schools, a K-8 STEM academy, a middle school and a high school. These nine schools are attended by approximately 7,500 students who live in Little Elm, Frisco, Hackberry, Lakewood Village, The Colony and Oak Point. 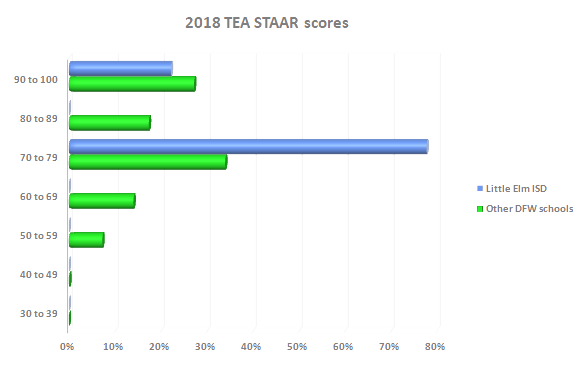 Little Ellm ISD's 2018 TEA STAAR component scaled score is 79. As is further explained in the Texas Education Agency 2018 Accountability Manual, the STAAR scaled score is calculated by first adding equal weightings of the percentage of assessments on which students’ performance mastered grade level, met grade level and approached grade level, dividing the sum by 3 and rounding it to the nearest whole percentage. This raw STAAR raw component score is then adjusted or “scaled” by using a conversion table to align accountability letter grades and scores of Texas public school districts and campuses. As depicted in the 2018 TEA STAARS scores graph (right) and shown in the Little Ellm ISD schools table (below), two Little Ellm ISD campuses attained TEA STAAR scaled scores between 90 and 100 and seven Little Ellm ISD campuses had STAAR scaled scores between 70 and 79. Students living in the north Dallas suburbs profiled on this website attend four Little Ellm ISD schools. One of these campuses have a 2018 TEA STAAR scaled score between 90 and 100 and the STAAR scaled scores of three campuses are between 70 and 79. The 2018 accountability rating for all Little Ellm ISD schools is Met Standard, the TEA's highest campus rating. Additional academic performance, student enrollment, teacher staffing and other information about these schools is available by clicking on selected campus names. For information about other public schools attended by Frisco students click on this Frisco schools link. Shown below is a typical website presentation of currently listed homes that are more or less in the middle of the Little Elm ISD single-family homes price range. A similar presentation of all currently listed Little Elm ISD single-family homes is available on this Little Elm ISD homes for sale page. The default display order of the property listings shown below is number of days listed, but other sort orders can be selected. The property display also can be easily changed from the default grid display to a detailed list display. If you are viewing this page on a mobile device, a map that shows the location of the selected properties can be displayed by clicking on the map icon.